If you are looking to upload unlimited files and documents and manage them from anywhere in the world using just a web browser then Omnistar's document management system is the software for you. Omnistar document management system is an easy to use tool that allows non-technical users better document management. Using a simple java upload tool, you will easily share files with your unlimited users from a secure server. 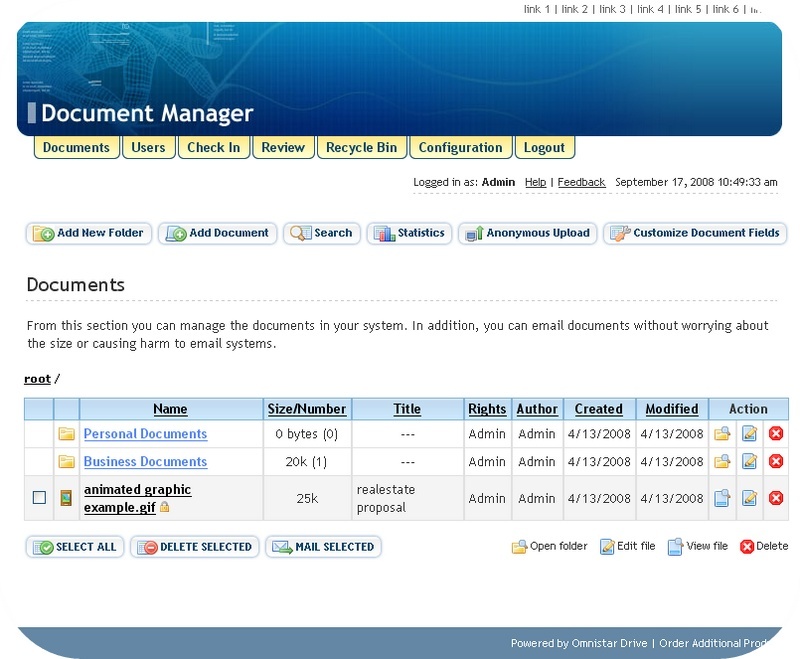 Omnistar Drive is a web based document manager software solution. ...... down by mail. Eliminating time spent on email can add productive work hours. * Absolutely no installation of desktop software required, system is easy to use - Most FTP programs are unwieldy to install and may also require desktop software, but this problem is eliminated when you use Omnistar drive because it does not call for desktop software. The drivers they are totally web based and hence you can download or upload files with ease. This again is time saving and in business time saved is time gained. * Optimum security for transferring and storing files - You do not have to worry about the security of your files because Omnistar Drive software may be installed on a secure server with a valid SSL certificate and this ensures that all files when uploaded or downloaded are secure. Hence all sensitive documents are securely transferred. WebDrive maps a drive letter to FTP, SFTP, FrontPage, S3, or WebDAV servers. DriveEraser is an ideal solution for the secure erase of data. Get instant device driver updates and downloads - over 1 million driver files! Qweas is providing links to Omnistar Drive 9.2 as a courtesy, and makes no representations regarding Omnistar Drive or any other applications or any information related thereto. Any questions, complaints or claims regarding this application Omnistar Drive 9.2 must be directed to the appropriate software vendor. You may click the publisher link of Omnistar Drive on the top of this page to get more details about the vendor.